The train trip from Tavira to Lisbon was not one I’d like to repeat! It was long, rattlely, a trifle on the smelly side, and just really rather uncomfortable! One does not like to complain about travel conditions, but I think the next time we come to Portugal, we’ll drive! Finally, we shook and shivered our way into Lisbon, found a taxi and after an eternity of narrow cobbled streets twisting up and down over Lisbon’s hills, we found ourselves in front of a heavy green door on what seemed to us a very narrow street (but later discovered was quite a major thoroughfare). We stood forlornly by the side of the door, our luggage piled against the peeling and cracked stonework on the side of the building for just a few minutes before the owner of the apartment arrived. We were ushered into a massive apartment with high ceilings, a full kitchen, a cute little outdoor space at the back, and all the mod cons. The only drawback was that the apartment did not include Internet which rather put a damper on my plans to get some work done! 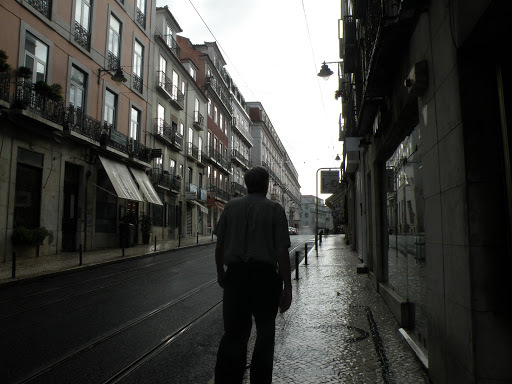 Our first hours in Lisbon were not particularly propitious. For some reason, I just felt overwhelmed by the crowds, the very narrow sidewalks, the old and crumbling stonework everywhere, the ancient streetcars rattling by inches from the edge of the sidewalk, and the fair sprinkling of beggars. 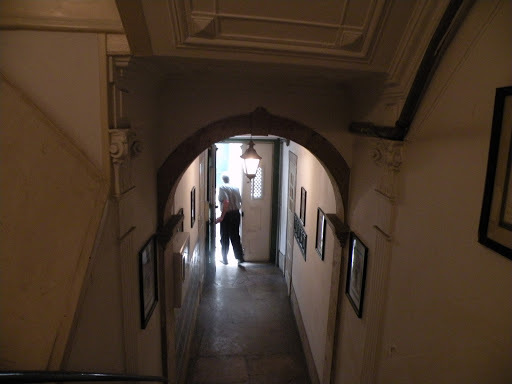 At first blush, Lisbon – or at least the Bairro Alto area that we were in – appears a bit run down and pretty gritty. Fortunately, this impression passed as we got more accustomed to our surroundings and were able to look past the cracked and worn facades of many of the buildings to see a solid, working city that had a great deal of charm to recommend it. But on our first evening, we managed to just grab a sandwich at a local café, have a quick chat with two fellows from Norway, buy a few groceries at the local mini mart (mini being the operative word), and then just stretch out on the rather comfy couches in the apartment to indulge in an evening of American TV! In Portugal, the American and British TV shows are not dubbed as they are in Spain. The programs (everything from Teenage Ninja Turtles to Grey’s Anatomy and Glee!) are broadcast in English with Portuguese subtitles. At least we got to learn a bit of Portuguese as we watched a few episodes of Seinfeld followed by Gene Hackman and Denzel Washington in Crimson Tide. It was actually pretty good. And so to bed preparatory to our first visit to the gallery where Gregg’s Lisbon show will be held.